From early November 2014 to December 2015, we will be paying tribute to Monsieur Julius Koch, the tallest Montois ever who died in the city on 30 March 1902. Victim of a form of gigantism, this “simple man” from a fairground background measured 2m58 and took to the stages of music halls throughout Europe under his stage name of CONSTANTIN. 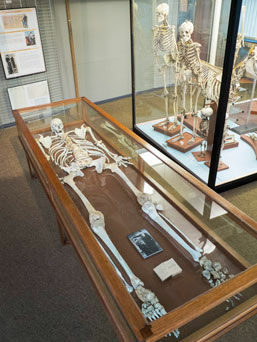 His skeleton lies today in the Natural History Museum, awakening the curiosity of the little ones… and the fully-grown. A multi-disciplinary team - visual artists, musicians, scientists and literary people - from here and elsewhere will be referring to his person over the course of one year. Julius Koch will live again in the locations which saw him dance, stumble and fall. A cortège, conferences, a mass, a “cold meat” meal, a headstone, a birthday, a concert… will, through him, imbue unexpected places with the notion of how all things are relative. Big today, small tomorrow; small yesterday, big tomorrow.